With Virtual Reality being a new and rising technology, you can expect it to be on the higher end when it comes to requirements. Games in VR need to be able to run at 90FPS for maximum smoothness and a lag free experience. If you can’t hit these amounts of frames when it comes to Virtual Reality Games, inside the VR headset will be stuttering and will take away the feeling of being inside the game. As well as Hardware Requirements for your PC, you will also need to consider the amount of space in your room. To get the most out of VR, you will need around 1.5m x 2m. So you could find yourself moving furniture around for maximum enjoyment. One think to also remember is the Vive Lighthouses need to be around 15ft apart in your room, usually on a diagonal angle facing each other. However if you aren’t sure that you meet these requirements, Valve released a small tool which you can run yourself through Steam. It’s called the ‘Steam VR Performance Test‘, and it’s free to use. Install it through Steam and run it. 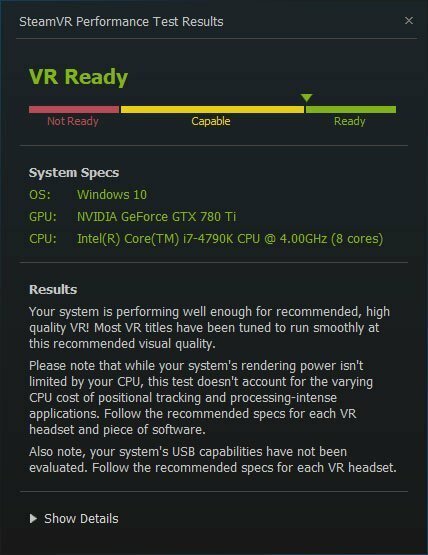 The Steam VR Performance Test tool will scan your PC and components to check if your PC is capable of running Virtual Reality games, as well as if you meet the minimum requirements. You’ll be run through a quick VR Scene where your FPS is tested. Ideally, we want to be hitting at least 90 FPS. Once complete, a window will pop up with your Hardware specifications and if your PC meets the minimum requirements for Virtual Reality. If you did, congratulations. If not, it’s probably time for an upgrade to some parts. With the HTC Vive, you are given 2 modes when settings up. ‘Room Scale‘ and ‘Standing Only‘. Room Scale means you have enough space in your play space to walk around. This will require a minimum of play space of 1.5 metres x 2 metres (or 5ft by 6.5ft). However the more space you have the better. Personally, my play space currently sits at around 2m x 2m and I haven’t had any problems yet. Unfortunately, I’ve come across maybe two games that work in Room Scale only. With Standing Only, you’ll need a much smaller amount of space and aren’t required to move around. Most games accommodate for this with a teleport feature or bringing objects closer to you. 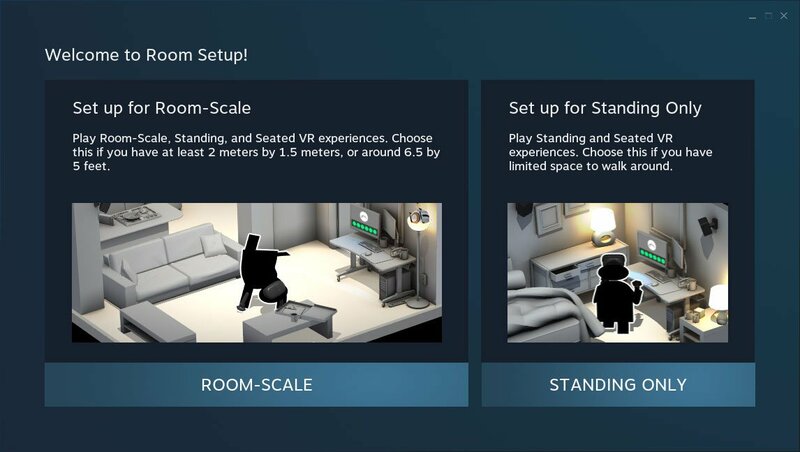 Whilst Room Scale is great for a lot of games, playing with Standing Only in the HTC Vive is still really fun.